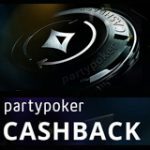 Poker players worldwide who have still never opened a PartyPoker account or made a real money deposit will be pleased that PartyPoker is offering new signing up players an excellent new "SUPER SIGN UP BONUS CODE" for new deposits at Partypoker which will include a 100% up to $500 bonus or £250 (UK), the biggest the site has ever put up for grabs the bonus to date is set for either US Dollar accounts or GB Pounds, for those who have not yet joined Party Poker there quite simply has never been a better time to join and take advantage of The biggest PartyPoker bonus code ever ! For US Dollars (USD $) use WAPBIG as your Party Poker bonus code. For UK (Pounds) use LARGE as your bonus code at PartyPoker. Note: the "Super Bonus code is only valid at PartyPoker and is not valid at PartyCasino. How do you as a player benefit? 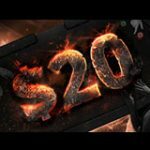 PartyPoker's new biggest bonus code is the most aggressive bonus they have ever had on offer for new players, this bonus is unique as it is partially released according to play but USD players will get a 100% up to $500 Bonus when signing up with our newest PartyPoker bonus code WAPBIG and English players are set up with a massive 100% up to £250 Bonus when using LARGE when creating a new PartyAccount. Due to the size of the new bonus PartyPoker have put limits on them obviously for players who may abuse them, there is a minimum deposit required and a restricted release depending on the currency you select when creating your account. 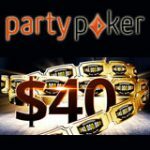 The Party Poker minimum deposit for US $ - 100% up to $500 Bonus is $25 and in order to release the full bonus amount payers need to earn 5 times the bonus amount in PartyPoints, for UK players or those using the pounds offer of 100% up to £250 the minimum deposit is £15 with players needing to earn ten times the bonus amount in PartyPoints. 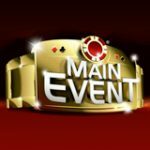 Other restrictions include: PartyPoints earned through play at PartyPoker.com only will apply towards the release restrictions of this bonus, The bonus is split into 5 equal parts with each part making up 20% of the actual full bonus amount, all release restrictions must be met within 90 days of the account creation date. A player deposits $100 will be eligible to receive $100 as a sign up bonus. He then need to accumulate 500 (5 x 100) PartyPoints to receive the full bonus. The bonus amount is divided into 5 parts with each part being $20, each time the player earns 100 PartyPoints $20 of the total bonus amount will be released into his account. Lets say an English player makes a deposit of £50 he will be eligible to receive a bonus of £50. He will need to earn 500 PartyPoints (10 x 50) in order to receive his full bonus amount which is also divided into 5 parts of £10 a piece. 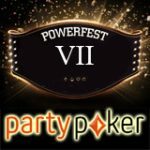 As the player earns 100 PartyPoints £10 of the bonus amount will be released into his Party Poker account. 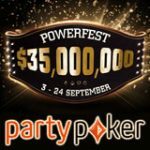 BIGGEST - 30% up to $150 see our PartyPoker page for more information on bonuses.